If there's one thing you can count on in Colorado during September, it's the surprisingly HOT days! So annoying when I'm tryna sip on that Pumpkin Spice Latte AMIRIGHT?! (If you want to make your own Pumpkin Spice Latte, click Here! Nonetheless, it brought the excuse to head to Little Man Ice Cream with Jordyn! We enjoyed a super sunny day in Denver together, ate reaaally good ice cream (mine was the candied ginger and grapefruit sorbet!) and talked about friendship, clothes, blogging, and lots of great stuff. I am loving the Easy Dress in mustard from Roolee. It is super comfortable and stretchy! I love the sleeve length and fit of the skirt. I wanted something I could easily wear on warmer days, but transition into fall with a light jacket, and this dress is perfect. Plus the color is so bright and happy! One thing I really value is staying young! 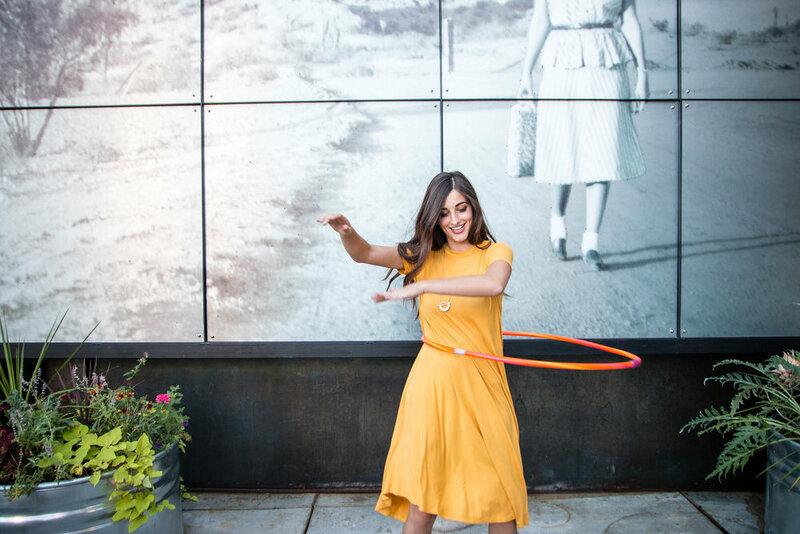 If ever there is a chance to enjoy the simple joys like hoola-hooping, I'll take it. There's only so much room for adulting in life, and expressing joy through the giddiness of childlike fun releases a freedom that makes growing up a little bit easier. I like to add a little pop of simple jewelry with this cute rose gold geometric necklace from H&M. 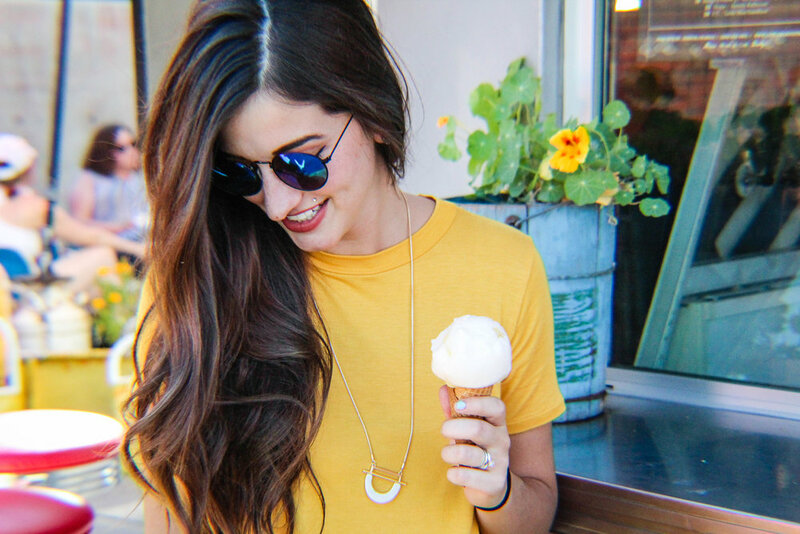 It's the perfect length and has a little marble detail in the white half-moon pendant. These shoes are from H&M as well, and are really easy to walk around in. Check out that chunky heel!